Instead of us just telling you how good we are, we asked Annwen Harris (Roof Shingles UK) to tell us what she thinks of our cloud-based Sage One software. 1. Hi Annwen, could you please give me a brief summary of who you are, what you do and the name of your business? Our company name is GEM Partners Ltd but we trade under the name Roof Shingles UK. We are one of the main UK importers and retailers of IKO roofing shingles who are a global market leader in the roof shingle market (see www.roof-shingles.co.uk). Roof shingles are bitumen roof tiles similar to shed felt but a lot thicker, longer lasting and especially resistant to strong winds. They come in a variety of different shapes and colours so they look a lot better too. 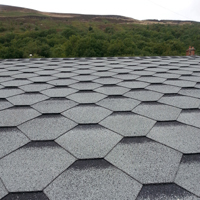 We are based in Cheshire and we supply roof shingles all over the UK to both trade and retail customers. Our roof shingles have been used on log cabins and sheds as well as larger projects such as beach huts and residential buildings. There are 3 employees including myself and we also use agency workers. I have been using Sage One Accounts for 12 months. Before that I had a very old version of Sage’s desktop software but the cost to update it every year was so high that it wasn’t worth it for us. Sage One Accounts allows us to manage our finances quickly and easily with the invoice templates and invoice emailing capability. It’s not overly-complicated, like some accounts programmes, yet provides professional results. Payroll had been outsourced but we started doing that ourselves 12 months ago too and the cost of buying a new Sage desktop software for that was also offputting. With Sage One Payroll we get an up-to-date, easy-to-use system for a small charge each month. It’s easy to create and email invoices and the software is always up to date with the latest legislation. Make sure you have a good product that you believe in.